It's a very rare thing when two different toy companies release figures in the same scale for the same license at the same time. Different scales? Sure. NECA is making 18" Marvel figures even though Hasbro has the 4"-6" rights. No big deal. But imagine if Jazwares and Mattel both made Mortal Kombat toys at once, and both companies decided those toys should be 5" tall. It'd be super weird, right? Well, that's what's happened now, in a rather roundabout way. As you're well aware, Mattel is making The Dark Knight Rises toys, in both embarrassing 4" and not completely awful 6" versions. 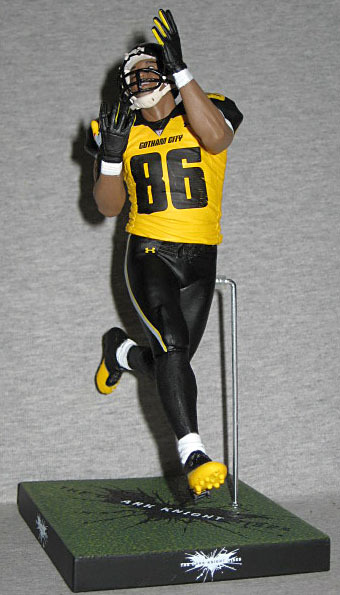 And now, McFarlane Toys has also made a 6"-scaled DKR figure by releasing former Pittsburgh Steeler Hines Ward in the uniform he wore as a member of the fictious Gotham Rogues. Ward's versatility, hands and willingness to block served him well as a professional wide receiver. Since being drafted by the Gotham Rogues in the third round of the 1998 Draft, he earned three team Most Valuable Player selections. He was also a four-time Pro Bowl selection (2001-2004). Ward had a streak of four consecutive 1,000 yard seasons. The streak was broken in the 2005 season during which he missed a game due to injury. In 2002, he set a Rogues franchise record for receptions (112) and touchdowns (12) and was named to his first of two consecutive All-NFF teams. Yes, the NFF; you know, the National Football... Federation? I don't know, I'm not a big porksball fan. Hines Ward was the only player to survive the devastating terrorist attacks at Gotham Stadium - not just from the Rogues, but from the Rapid City Monuments, to boot. We've all seen the footage played over and over on the news in the months since the attack - Ward running down the field just steps ahead of the collapse, then turning to see the destruction behind him - so it's disappointing that rather than giving us a figure in that pose, McToys just repainted the Series 24 figure and called it a day. This figure shows him catching a pass, not running back a kickoff. They could have just put the existing head on a more appropriate body, couldn't they? It's not like these are individualized sculpts or anything. The one part of the body that can't be swapped at will with any other wide receiver is the head. Hines Ward is half black and half Korean, and always seems to be smiling - he's the happiest man in football! The sculpt, whether done digitally or traditionally, captures the look on his face perfectly. He's looking back over his shoulder, where the pass would be coming from. 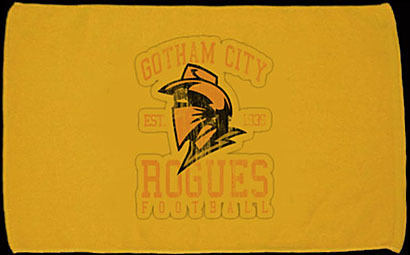 The Rogues uniform is black and yellow, with some gray stripes down the legs, at the shoulders, and on the gloves. The "86," "Gotham City" and "Ward" printed on his shirt are all crisp, and you can even make out the tiny Under Armour logos! The Rogues had just changed their logo from the "handgun" version to a stylish update of the original "Bandit" logo that was first seen in 1939, so it's that new version that's painted on both sides of the helmet. 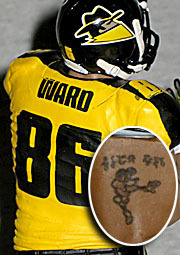 And because McFarlane is all about capturing the full detail of the athletes, they even got Ward's tattoo right - Mickey Mouse in the Heisman Trophy pose, with Hines' name in Korean above it. 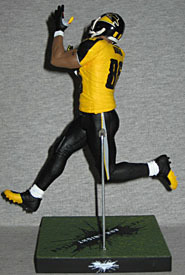 McFarlane almost always gives the SportsPicks dynamic poses, and this is no exception. Hines is in mid-run, and thus in mid-air. A metal rod plugs into the figure's hip and also into the included display base, to keep him suspended. The base is 3¾" by 3½" and ½" thick. 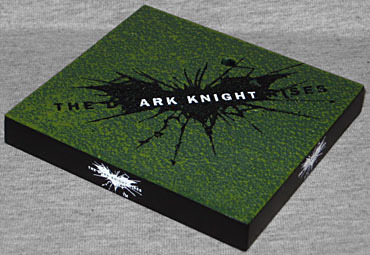 The top is textured to represent grass, and there are Dark Knight Rises logos on all four sides and one on the top. The top one looks like a hole beginning to appear in the field, which seems appropriate. Poor planning with the font choice makes the logo look like it says "Thed Ark Knight Rises," though - someone should have noticed that during production. In case there were any question this was an official Dark Knight Rises product, the packaging (a typical McFarlane clamshell) features the movie logo and a giant picture of Batman. There's a Rogues helmet in the lower lefthand corner, and the team logo in the upper right. Next to a big, clear image of the NFF logo, which also appears at the neck of the jersey. The back of the packaging credits copyrights to Hines Ward (for the likeness) and Under Armor (for the logo), but not the NFL nor the Players Association, since they have nothing to do with this release. This figure's pose may not match what we saw in the film, but the design does. It was really clever of McToys to come up with this, and the fact that it's in the same scale as the Movie Masters (more or less) just makes it that much more awesome. 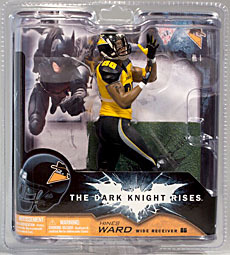 Hines Ward is available at Toys Я Us, either in the Dark Knight Rises or the SportsPicks areas - luckily my TRU keeps them near each other, or I may not have noticed him. Go Rogues!